According to Health Minister, Professor Isaac Adewole, has expressed that the monkeypox disease flare-up which has been reported in Bayelsa, Akwa Ibom, Rivers, Ogun, Cross Rivers and Lagos states are just 'suspicion' right now. He said that specimens from patients have been sent to the World Health Organization focus in Senegal and test outcomes are expected within 48 hours. The minister additionally disclosed that states did not report the outbreak of the disease on time, yet asked Nigerians not to panic. 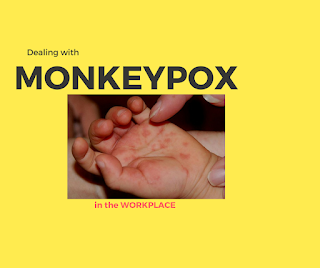 With this in mind, we'd to highlight the significance of dealing Monkey Pox in Workplace to help organizations in making a consistent and open workplace for those with the illness and their co-workers. Symptoms of this disease include fever, intense headache, aches and pain, Asthenia (severe lack of energy) and Lymphadenopathy (swollen lymph nodes). Staff in an organisation that has a similar symptoms should be giving serious medical attention and also have a special work space, this is because the disease is communicable. Preventing discrimination or the singling out of employees for a while based on their health status is encouraged workplace in order not to spread the disease among co-workers, victim should be giving serious health care. Doing so will help to create a supportive environment that encourages all employees to work together effectively, ensuring a harmonious work space for all. As at the moment, no specific treatment for the disease so prevention is highly advocated. Disease is self-limiting, it heals itself.